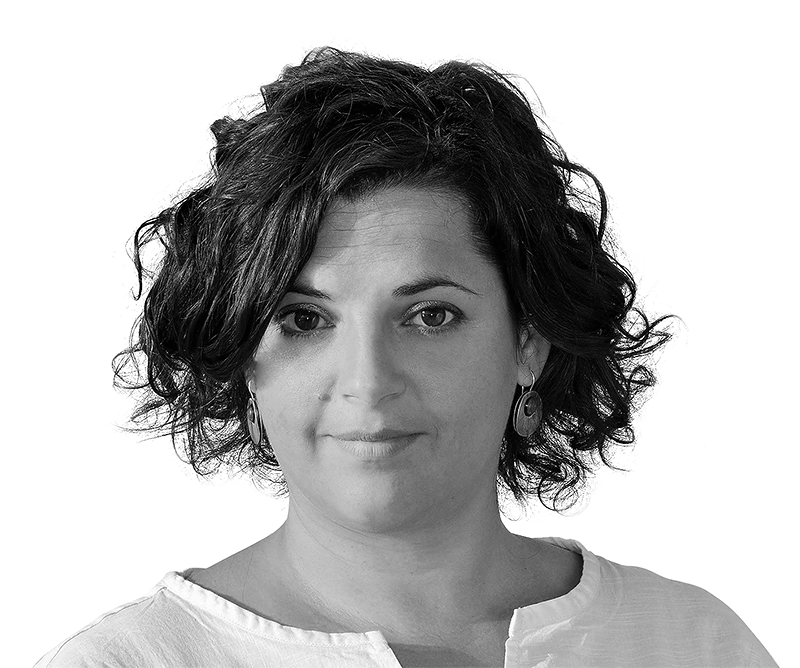 This is a guest post by Judit Kertesz, management consultant and design thinker. Design driven innovation is grounded in a deep understanding of the people whom we are designing. Without perceiving what formulates the user’s thoughts, design is pointless. In order to design services that will be used, liked, supported or bought by users, we need to understand how they think, the preferences they have, their behaviour and their communication in the very beginning of the design process. Empathizing with users can open new perspectives; it can inspire us and definitely helps us to understand the way users think and feel. Empathy is understanding people’s feelings, entering into their world of feelings and showing them that we feel this way. I think that aiming for empathy has a significant importance, especially if we work or live in a multicultural environment or easily can find ourselves among people who are in a different situation. we understand people around us: if we know what is important to them; how they think, we can predict their actions and reactions — so we can motivate them more easily and negotiate with them with more success. Watch the Dove Sketches video as a great example of showing empathy to consumers. Dove commercials became popular by talking about women’s self-confidence and inspiring them to feel inner harmony with themselves. Empathy is not a “you either have it or don’t” quality. Fortunately, we all have the capacity to be empathic. Listen without interrupting — we need to try to pay attention to not interrupting people. When I talk about interruption, I also mean interruption between sentences: often, people leave a “time-gap” between sentences while talking — and this is the time when we need to be silent. I know, it can be challenging, but you can practice it. Be present — put away your phone, don’t read a newspaper when interacting with someone. Pay attention to the world around you — look around when you are walking on the street, pay attention to the sounds, scents, the heat of the sun, the power of the wind. Anything. Pay attention to your own feelings when you interact with someone — although interaction might not make all of us feel the same way, if we are aware of the importance of our own feelings, it is easier to understand other people. Give recognition towards others — if you have a positive feeling towards a person, tell them (e.g. ”I agree with you”, “You did it well”, “Thank you”, “Wow”). Empathy maps allow us to understand a person from multiple viewpoints in relation to the service: it is a template or canvas that synthesizes the results of the user observation and shows it in a systematic way. Based on the results of the user observation, insights can be drawn and user needs can be identified, which can also be included in the map. From the designer’s point of view, empathy maps provide a guidance on identifying how a user thinks, what their main impression is on the service, and how their behavior is formulated. The results of an empathy interview should be absorbed in our thinking as well. Empathy maps can be used in the beginning of the design process while understanding the users, and also during the prototype-validation phase when we observe the users, while they are using the designed service. How to use an empathy map? To summarize the results of an interview or a user observation can be challenging. Sometimes it’s hard to decide on what to pay attention, what is significant or what is not, what is important in terms of motivation using a service. I think it is really helpful to have a useful tool in our hands, where we can collect the information gained from user research. While carrying out user research, you can observe directly what users say and do, but their thoughts, beliefs and feelings can only be inferred. This means that you should pay attention not only on words and actions, but also on non-verbal communication elements, i.e. body language, gestures, voice tone, word-characteristics, touch, etc. Empathy maps are bounded, but we can easily create a less and a more detailed template for ourselves — it depends on what we would like to achieve. It is a very flexible tool, which we can easily tailor to the character of the service and the project needs. Accordingly, it is very important to think before the observation and decide which aspects are important for us. You can draw your empathy map using a flipchart or simply use the pre-made template in RealtimeBoard. With the RealtimeBoard endless canvas, you can create an unlimited number of empathy maps, each of them can representing a persona. SAY — what are the key messages and the quotes that the user is saying? External communication is one of the first impressions we receive from a person. Even before meeting, we can check how a user communicates in social media or with other people (in case the communication is public). During the observation, quotes can be collected as well. DO — what actions and behaviour did you notice? During the observation, we can see how a user is acting physically. We can check whether they are buying a product or a service, or whether it is clear for them what to do with a certain product. THINK — what might the user be thinking? What are their beliefs? What are they worried or happy about? What thoughts or aspects might influence their behaviour? In order to avoid misunderstandings and biases, feel free to ask what the user is thinking. Although in some cases it is hard to express feelings, if we are patient, ask good questions, listen to the users and show trust and discretion, users may share their honest thoughts with us. The point here to observe their internal thinking process — the reasons behind their behaviour, including the role of their influencers. It is better if we can identify the user’s own thoughts. FEEL — what emotions might the user feel? Feelings also can only be inferred based on a user’s non-verbal communication signs. If we have a presumption of feeling, we can ask the user to validate it (e.g. “Do I feel correctly that this makes you upset?”). If we are empathic enough, they will share their feelings with us. IDENTIFY NEEDS — why is he/she using this service? Why would they like to change? Necessities can arise due to events, life situations, different occasions, etc. Needs are necessities and not goals or solutions; you can express them with verbs. It can be very interesting to draw needs when there is a contradiction on your empathy map. For example, there can be a disconnection between what someone says and they do or think. IDENTIFY INSIGHTS, PAINS & GAINS — what are the pain points that might be experienced by the user? What would the user like to accomplish? What are their gains from using the service? Based on the observations, we can assume the pain points of the user and can possibly find their place in the User Journey. A careful observation can support us to draw up a sophisticated goal of the user and create a design challenge. Filling out an Empathy map correctly is not as easy as you’d think. We need to master interviewing skills, observation skills, and we need to be able to read body language. Last but not the least, we need to empathize with the users. If we are preparing for user research, it is useful to pay attention to several elements, in order to fill in the empathy map with as realistic information as possible. Let the user to share his/her views with you — ask open questions and don’t interrupt. Listen carefully. Take the user’s perspective! — try to see the world as others see it. This requires putting your own “stuff” aside to see the situation through their eyes. Be non-judgmental — judgement of another person’s situation discounts the experience and is an attempt to protect ourselves from the pain of the situation. 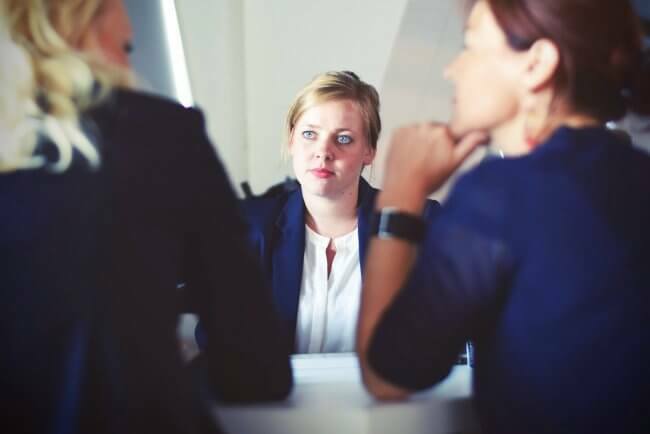 Look for repetitions — elements that are done or mentioned more times during the interview should be definitely part of the completed Empathy Map. Be curious — you get to know more information if you are curious and ask questions. Users might be reticent, so they need your help to open up. Listen attentively — a secret of a good interview is to let the user talk and let them know that you understand their feelings. Think about it: how good a feeling it is when someone listens to what we say? If the user sees that we are paying attention, it will be easier for them to share their feelings and thoughts with us. Understand another person’s feelings — we have to be in touch with our own feelings in order to understand someone else’s. This requires putting your own “stuff” aside to focus on the user. Don’t be superficial — being superficial and having a superiority mindset can kill the trust between you and the user. What would you tell anyone about your feelings who makes you feel subordinate? Be humble — never forget that the user is the end-point whose behaviour will decide whether you’ve designed a good service. During the observation, the user is the one who helps you to do the best design. Train yourself in observation — one’s body language often says more about oneself than 1000 words. An empathy map enables us to see the user from more perspectives. Patterns say a lot, as well as contradictions — and that is important information. 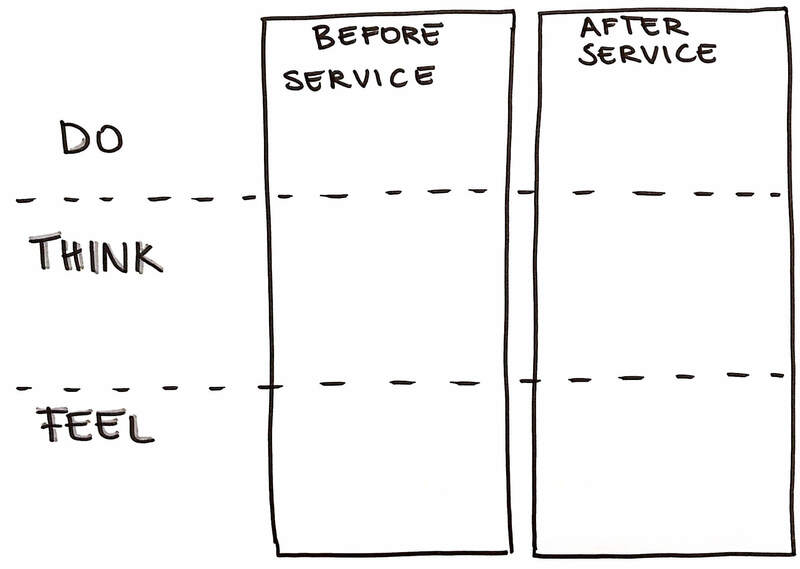 It can happen that a user is not happy about the service, but still uses it. Or, they have a very positive feeling about a service, but not using it as often. These are issues that needs to be researched further. 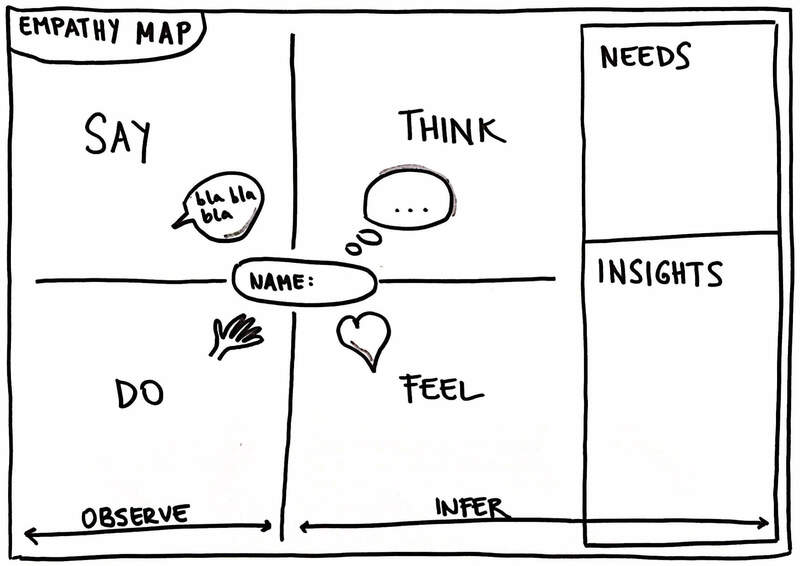 Personally, I think that, although it is a very useful tool to visually introduce a user, it should be taken into account that an empathy map shows a state at a particular moment in time. Therefore, it is worth going back to your map from time to time, and keep adding insights and assumptions, especially after observing or talking with customers similar to your profile.